It's OK, Aaron... I have trouble remembering, too! Are any of you fine folks attending Geek Girl Con in Seattle this weekend? 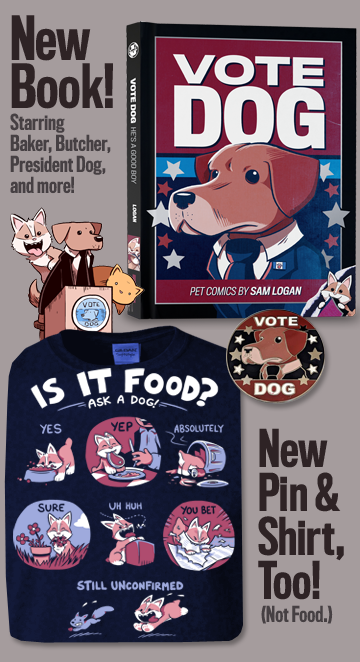 While I won't be there myself, my lovely co-conspiritor Shannon will be, at table 313/314 in the exhibitor hall. 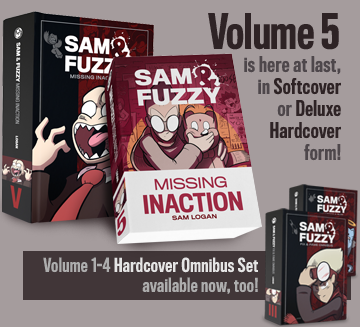 In addition to some of the comics anthologies she and I have contributed to, Shan will also have a few Sam and Fuzzy shirts in tow. So go say hi! That time has come, team! Join us in mourning for the passing of three classic shirt designs. I always hate to see my precious babies go, but as always, we've got to space for new stuff! My Skills Are Varied As They Are Impractical, Steampower: 100& Practical for Everything, and Ninja Showdown are now all on the chopping block, and are available for only $15 from now until we run out. So if you were hoping to nab one... now's your last chance!